There is a staggering amount of oxidants out there and their use in synthesis is very context-dependent. The redox potential reachable with a given oxidizing agent is the differentiating factor – one that establishes a unique footprint on molecules that act as electron donors. We had a series of student talks here at U of T earlier today and I was very intrigued by the lecture on hypervalent iodine derivatives by Brendan Peters of the Lautens lab. I thought I knew a lot about oxidants, but when I saw sodium perborate (commonly drawn composition: NaBO3), I realized that there might be a gap in what I know about its exact structure. This reagent is well suited for turning aromatic iodine derivatives into their oxidized forms. I looked things up later in the day and, as it turns out, the structure of NaBO3 formally corresponds to the dimer of two “O=B-O-O” derived units. The peroxide bridge is where this salt holds its oxidizing “mojo”. I started digging a bit deeper and looked for any structures with a B-O-O-B bridge. It turns out that not much is known! However, this is where I am weaving my story all the way back to last week, when Professor Warren Piers of the University of Calgary visited us and gave a superb talk on some novel iridium chemistry. He will probably kill me if were to disclose the unpublished work carried out in his lab, but I will not do that. Let’s keep amphoteros a respectable establishment. Instead, here is a published account from Warren’s recent past and it comes full circle to what I was fascinated with this morning when I pondered over NaBO3. 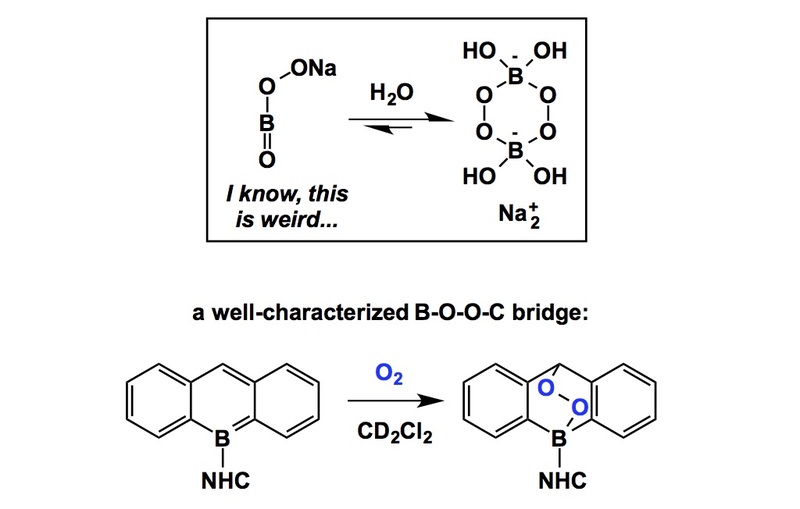 It turns out that Warren published an awesome reaction that features a boron-based peroxy bridge, although in a completely different context. Judge it by yourself below, but I think this is super cool. After I read Warren’s piece, I went back to Scopus and searched for more papers specifically dedicated to sodium perborate. After 10 seconds I realized that all 800+ of them come from dentistry-related journals (toothpaste…), which reminded me about the bridge I got earlier this week after breaking one of my molars. At this point I am done with searching and will get ready for the ChemClub Christmas party, wherein I plan to forget about my pains while sipping one of them tasty Leffe beverages (remember Samuel L. Jackson in Pulp Fiction?) at the Beergarden. Always enjoy your thoughts, but particularly liked this post! Thanks for the kind words. Another fascinating B-O-O-B compound was recently disclosed by Theo Agapie (Angew. Chem. Int. Ed. 2014, 53, 12893 –12896) that makes a nice connection with the NaBO3 case. Could be a very interesting and useful reagent. Thanks Warren! I will check that paper, for sure.